Most people think of dental implants as a purely cosmetic treatment option. In reality, implants not only enhance your smile, they also restore lost functionality and guard against further tooth loss. This makes them an option worth considering even if the teeth you’re missing are in the back of your mouth where no one can see them. To understand why even one missing tooth is a serious issue, think of how you chew your food. Your teeth not only move up and down, they also work side to side and at multiple angles, breaking down your meals to make them easier for you to digest. This means that they undergo a great deal of stress throughout the course of an average day. One of the ways your teeth deal with these challenges is to rely on each other for support. You can think of them as being like a row of soldiers standing at the front line of a battlefield. If one goes down, then this exposes those on either side to increased danger. They stand or fall together. That’s exactly what happens when you lose a tooth. Those around it are exposed to additional stress. Not only that, but the gap that’s left where the tooth used to be is at risk of becoming infected. At this point, your teeth are less like a line of soldiers than a row of dominoes. They begin to fall one at a time, until in the end you’re left with serious oral health issues. You may have heard that tooth loss often starts at the back of the mouth. It’s true. One reason is that your rear, or posterior, teeth do most of the work when it comes to chewing your food. This exposes them to the bulk of the decay-causing bacteria in your mouth. A properly placed dental implant becomes part of your body, thanks to a natural process called This sets implants apart from crowns and bridges, both of which rely on either adhesives or the remaining teeth for much of their integrity. An implant requires only the same care you give to your natural teeth, such as regular brushing and flowing. Unlike dentures, there’s no need to apply messy adhesives or remove the appliance for cleaning and soaking. Dental implants can last from 10 years to a lifetime, making them a true long-term approach to restoration. Modern dental implants are virtually indistinguishable from natural teeth. You’ll never have to worry about them looking out of place or ruining your smile. In fact, they offer substantial cosmetic as well as practical benefits. As with most dental problems, the best way to treat a missing tooth is by preventing it from happening in the first place. 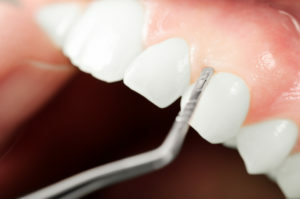 But, when a tooth is lost, an implant not only can correct the problem but safeguard your other teeth as well. Talk to your dentist about your preventative and restorational options during your next appointment. Dr. Nelson Y. Howard is a skilled cosmetic dentist with advanced training in implant placement and other restorational techniques. You can reach his office online or by calling (760) 599-6559.